Gov. Tony Evers speaking at a renewable energy conference Thursday. Wisconsin Gov. Tony Evers is promoting renewable energy in the state. But a Republican legislator says any expansion of electricity generation from sources like solar and wind should be market-driven. 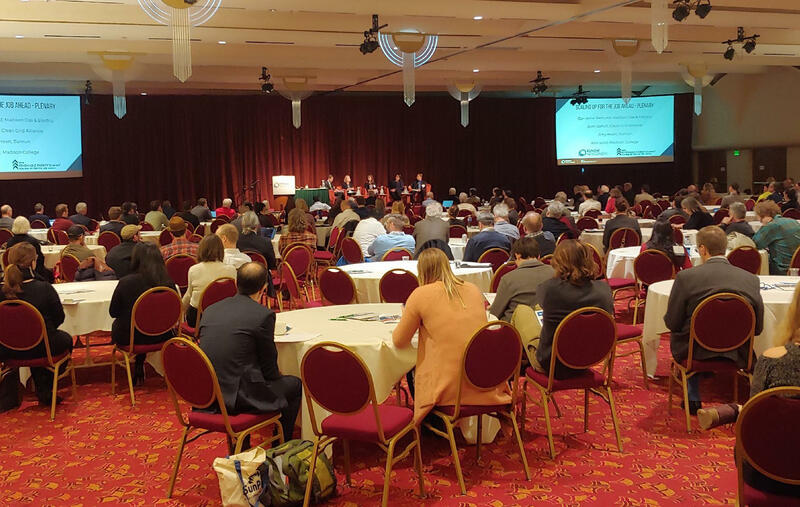 Evers spoke Thursday to an annual conference held by the group RENEW Wisconsin. He's the first Wisconsin governor to do so. He says it's time to change state agency attitudes about renewables. Evers says it's "absolutely important we move ahead in this area. For too long, we've been kicking the can down the road as it relates to science and innovation in this area." Evers says Lt. Gov. Mandela Barnes is also a huge supporter of energy independence and will help coordinate the state's efforts. “A lot of our agencies have pieces of this puzzle, and I've asked Mandela, and he's very, very excited to be the point person within our state government to help connect the dots. Make it easier for not only consumers, but businesses, to think through how this innovation should look," Evers said. Former Gov. Scott Walker rarely publicly spoke about climate change, and his administration ordered some references to the topic scrubbed from state websites. But Evers told the RENEW conference that he has a different view. Attendees of the RENEW conference listen as panelists speak on Thursday. "Climate change is real, and an imminent threat to our state and our economy in Wisconsin. We have to do more to incorporate science into those decisions and to our work," Evers said. Renewable energy supporters say more use of wind, solar and other sources can reduce reliance on fossil fuels such as coal and natural gas. Burning of fossil fuels contributes to global warming. But solar energy, and to a smaller extent wind power, grew in Wisconsin during the eight years of the Walker administration. At a panel following Evers' remarks, Rep. Mike Kuglitsch (R- New Berlin) said he wants to make sure electricity generated from renewables is reliable and affordable, and expansion is driven by the free market. "And it's to a point now where we don't need the government mandate anymore saying you have to do this," Kuglitsch said. Some other states have set higher renewable energy requirements than Wisconsin, and some environmental groups have proposed boosting Wisconsin's goal. Others like state Rep. David Crowley (D-Milwaukee) are at least hoping for a more targeted expansion. “Especially being in a community in the city of Milwaukee, where there are many low-income folks who wouldn't have the opportunity to pay for it. At the same time, how do we make sure those folks have the opportunity to connect into renewable energies," Crowley said. The Public Service Commission of Wisconsin remains controlled by Republican appointees. Their thoughts on adding renewables may get a closer look in a couple of cases this year involving large solar projects planned by electric utilities. Editor's note: The original story from Jan. 17, 2019, has been updated. During ice storms or heavy snowfalls, many people often worry about their power going out. But for a nature preserve near Appleton, that's less of a concern because its headquarters is part of what's called a microgrid. The 700-acre compound generates its own power and stores it for use, greatly reducing the preserve's reliance on electricity provided by the local utility WE Energies. Wisconsin scientists have made two breakthroughs that may help hydrogen become a bigger player in renewable energy production and storage. While the researchers say there's still a long way to go with their work, it's a step toward the "hydrogen economy" some were predicting nearly 20 years ago. Wisconsin investors are starting to use a relatively new federal program called Designated Economic Opportunity Zones that aims to help what the government says are economically-distressed areas. Several cautions remain, but start-up technology firms are among the businesses that could benefit if the program succeeds. Researchers are trying to make guns safer, partly through devices that limit who can fire a weapon. The science and financing still have a ways to go before many gun owners have a so called "smart gun." But a southeastern Wisconsin activist group is optimistic enough about gun innovation that it sponsored a Firearm Safety Expo on Wednesday. The local activist group Common Ground sponsored a Firearm Safety Expo Wednesday at MATC-South Campus in Oak Creek.